Lee is sort of the "West Chester/Liberty guy." Deeply committed to his community, he is actively involved in the West Chester-Liberty Chamber Alliance. 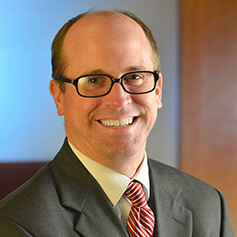 Lee Geiger has a reputation as one of the Firm’s three most reluctant spenders. What separates him from the other two is his appreciation for air conditioning. His compass is set on “frugal.” It’s a trait he gleaned from his parents. It was more important to them, for example, that he and his sister attend parochial school than they drive stylish automobiles. Lee says his mom drove cars until they died. He remembers her driving a Dodge Omni for 10 years. When the trunk dropped to the back axle, she had it welded back. She kept driving it until the mechanic told her that, by any measurement, it was no longer safe. Lee grew up in Finneytown, the first of two children. His father is secretary-treasurer of The Cincinnati Air Conditioning Co., and his mother does conference planning for P&G. He worked summers at Paramount King’s Island, 60 to 70 hours a week. He was the guy who tried to get park-goers to break a plate or put a ring around the Coke bottle. The following summers, he supervised those guys. He has a natural, easy sense of humor – one where he makes fun of himself, not others. He considers himself a bit of a nerd, but he’s convinced nerds will eventually inherit the Earth. The third, and most important to him, is his family. He met his wife, Karen, at King’s Island, where she ran a ride called Skycoaster. They have three awesome children – Sam, Anna and Claire. Lee’s idea of a good time is going to the kids' sporting events and hanging out with family and friends. He’s working hard to do as well by his family as his parents did by him. His colleagues joke about his tendency to be cautious with a dollar, but above and beyond that, they think of him as family-focused. As a Graydon partner, he dedicates himself to helping clients achieve their goals – and more than that, to helping them define their highest goals. Lee provides clients with prompt, practical and usable legal advice. His goal is to make your problems become his problems. That way you can focus on running your business and sleep a bit better at night. Lee helps public and private employers of all sizes address employee issues. This covers the entire lifecycle of an employee: hiring issues, performance problems, payment/overtime issues, leaves of absence (including FMLA), non-competition agreements, discipline and discharge. He also represents unionized companies in collective bargaining negotiations, union organizing campaigns, grievances and arbitrations. Lee represents employers in matters before the Equal Employment Opportunity Commission (EEOC), Office of Civil Rights (OCR), Ohio Civil Rights Commission (OCRC), Occupational Safety & Health Administration (OSHA), U.S. Department of Labor (DOL), Ohio Department of Commerce, State Employment Relations Board (SERB) and the National Labor Relations Board (NLRB). He also represents clients in state and federal courts. Lee currently serves at chair of Graydon's Labor & Employment Group. Lee also helps public and private schools address student, special education and employee issues. These include Section 504 proceedings, special education matters, due process hearings, expulsion proceedings, manifestation hearings and labor negotiations. Lee has done more than 100 presentations to employer groups on a variety of labor and employment law topics. His presentations are vibrant and energetic – you will learn something and have fun in the process! Lee has published articles on a plethora of labor and employment topics and is co-author of Healthcare Labor and Employment Practice Guide that was published by the American Health Lawyer's Association. Lee has participated in numerous leadership classes including: United Way’s BOLD program, West Chester - Liberty Chamber Alliance’s Leadership 21, the Goering Center’s Leadership Development program, and the Fairfield Chamber of Commerce’s Leadership Fairfield class. Lee is a proud resident of Liberty Township where he lives with his amazing wife, Karen, and their three kids. When they’re not carting kids from one event to another, they enjoy cheering for the Cincinnati Reds.